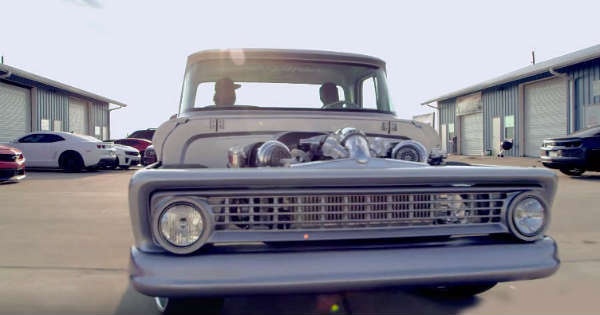 This 1000HP 1963 Chevrolet C10 Sounds About Right! - Muscle Cars Zone! We must say that over these past couple of years we have seen just about anything when it comes to amazing restored vehicles, vehicles that were brought to life yet once again. Pick-up trucks are somewhat specific and peculiar. Namely, you can either hate them or love them, and if you are the type of person who might not be much into them, this video will definitely change all of it. Hereby, we present you what could be the only 1963 Chevrolet C10 that you will ever need to see. It has been resurrected and given life to once again. This LS twin turbo monster is all custom-built and it indeed it looks absolutely stunning. However, it was finally time to put it on the dyno and test its actual power. The guys who made it expected that the 1963 Chevrolet C10 would be able to produce as much as 1,000 HP, which is something amazing. We get the chance to see the truck as it placed and strapped on the dyno and it is getting prepared for the test. After everything seems nice and ready, it was time to finally power up and push this monster to the absolute limit. Once it is up and going, it seems that nothing can stop it and stand on its way. The test is finally ready and once you take a look at the numbers, you are going to be shocked. The truck managed to go over 1,000 or 1,080HP to be precise. 1,000 horsepower sounds about right.